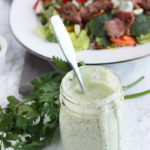 Creamy herb salad dressing is a taste of spring. Fresh parsley and dill are combined with sour cream, yogurt and garlic. Perfect for salads or chopped fresh vegetables. Serve over salad or with fresh vegetables.